It was Mama Chan’s birthday; it warrants a special restaurant. Burnt Ends ranks 30th on Asia’s Top, an Australian barbecue restaurant with countertop seating to watch the chefs at work - this will do. The dining room was intimate and energetic, just one row of bar seats across the open kitchen, where half the space was taken up by the custom built oven and grills, burning apple and almond wood. The chefs were manning their stations with utmost concentration, with Chef David Pynt giving each dish the okay before it goes out. The menu changes daily but there were a couple of signatures that I heard great things about. Dishes are designed for sharing, so the kitchen thoughtfully divided everything in 3’s for us. This is a raw, cured sausage made with ground pork, paprika and spices. The mincing of chorizo smears the nutty aroma of lard on the crispy sourdough toast, and the familiar powerful chorizo flavours presented in a smooth tartare texture. Personally I still prefer a beef tartare but this definitely perked up our tastebuds. This bad boy is a labour of love; slow-smoked short ribs until the meat is reduced to shreds with a soft poke, followed by reduction of the meat juice with port and red wine, blended with kneaded butter to thicken to a maple syrup consistency. Mix in some carrots and veg sautéed in butter for that jammy sweetness and juicy softness, together with the oh-so-tender beef pieces, laced with small globules of melt-in-mouth tendons – the ultra-concentrated stew was oozing intense beefy richness. The piquant pickles just added that crunch and cleansed our palate for a lighter finish. Mind-bendingly gorgeous. I was hesitant to order the renowned Sanger; a pulled pork burger is… well a pulled pork burger, and these are easily good from any food truck in London. I’m glad I went for it, because Papa Chan absolutely smashed it. There was so much meat juice locked in the mass of slow-smoked pork shoulder, as if Chef had hidden a small pocket of broth between the layers. The chipotle in the aioli was very restrained, just a brief sharp kick as the meatiness invade the tastebuds. The brioche held up very well against the pile of succulent meat, as a soft bed to absorb the flavours as one bites and release them again with every chew. We went for 250g, and the chef came to show us the steak before grilling. I’m a fan of onglet steak; for an inexpensive cut, I think of it as the poor man’s version of tenderloin - lean and flavourful. With the silverskin removed and trimmed, the cut is super tender with very distinctive grain running through the muscles. The chef rocked it under super high heat on the barbecue to give it a nice char without overcooking it. 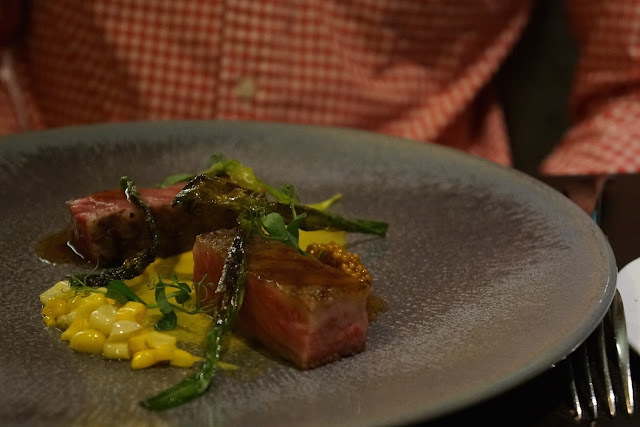 The steak was served sliced, against the grains, revealing the deep ruby meat - a perfect medium rare. The small discs of bone marrow added buttery fragrance as they melted away on tongue, leaving the beefy grease to mingle with the full bovine flavours. This could be the best onglet yet. There was a mini-starter for the pigeon. It was whipped liver pate served on toast with a dollop of cranberry jam. The pate had a note of dark chocolate to suppress the usual offal pungency, it worked beautifully with the tangy compote. The pigeon was served medium rare, its crimson muscles gleaming exquisitely. The bird carried powerful gamey flavours in its smooth muscles, without being too bloody. The texture was delicate and moist, with a subtle smokiness on the skin. I thought the plum sauce was a tad too sweet though. It was good, but if I could choose again, I would have gone for the pork chop. I feel that the grill works its magic better on hunky meats rather than dingy birds, which perhaps demands more finesse in execution. A very tangy salad with a generous sprinkle of hazelnuts. Mama Chan got a candle on her banana fritter for her birthday. Dessert is definitely more of an after-thought here - I would have chosen somewhere else if it wasn’t for the candle, for completeness. Burnt Ends did very well. It has taken barbecue to a new level by adding sophistication and elegance to the dishes. The chefs have mastered the art of slow-roasting, grilling, smoking etc to bring out the best of the meat ingredients, delivering a menu with great variety. Just as we were leaving, someone ordered the prime rib that was going at S$490/kg. That hunk of meat had 'eat-me' written all over it - I’m coming back for that. I aimed to please on this day. So lunch at Les Amis followed by a full body massage treatment felt like a safe bet. We had a promising start; the decor was tasteful, intricate without being uptight - he didn’t even mock the handbag stool too much. The menu is predominantly seafood driven, which makes sense given we’re in Singapore, until the man pointed out it’s still Atlantic cod / John Dory and Scottish salmon. Ah well. Since we were both more intrigued by the hot appetiser section, we gave up the cold starter for 2 hot ones instead. We also treated ourselves to half a bottle from Cote du Rhone, served at the right temperature, of course. The royale was composed of two layers of lustrous custard. 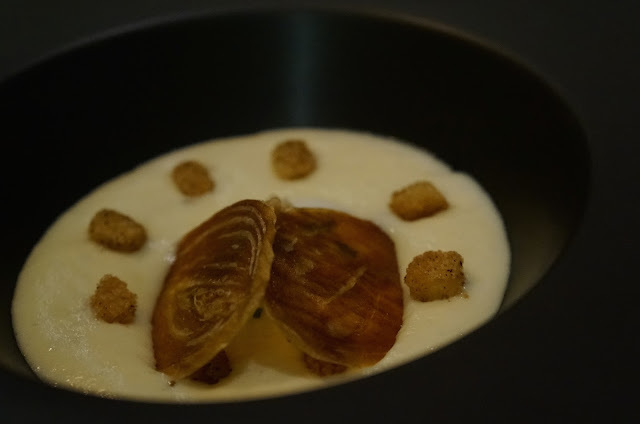 The top part was concentrated shellfish bisque that was packed with umami; the bottom layer was an even richer pate of foie gras, including yellow nuggets of fat. 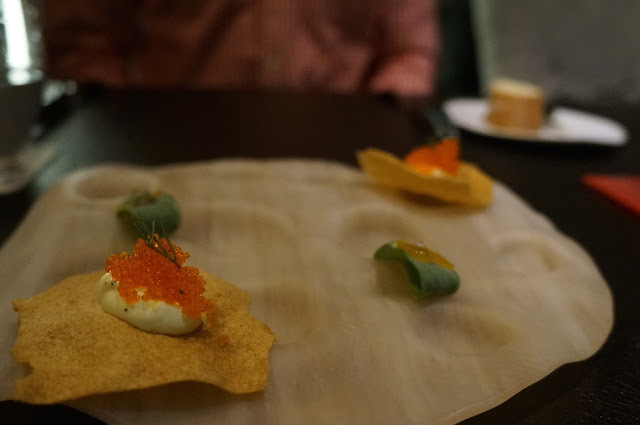 Though indulgent in terms of texture, the two layers didn’t complement each other, the slightly bitter undertone from the roe and liver were battling for attention. Had it been foie gras foam on top and possibly a sweet root vegetable puree, it may have worked better. 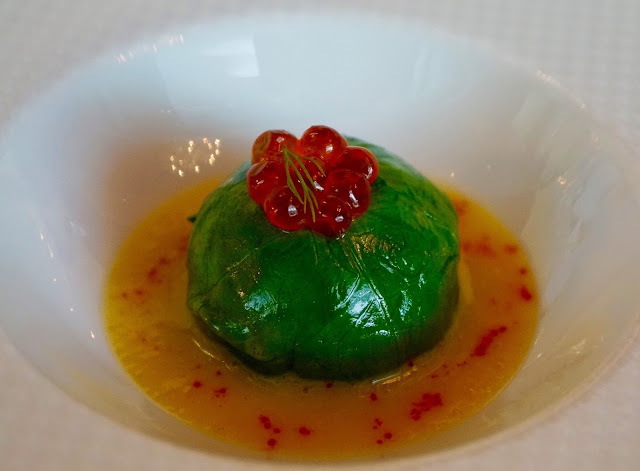 The spinach ball was densely packed with lobster meat mingled with shellfish mousse. The lack of lobster juice was made up by the crustacean sauce, and the meat was tender and gently springy. It’s a straight-forward starter with familiar flavours - simple but good. We should start with the positives: there is a lot of scampi. Apart from that, this ‘tart’ was quite disappointing. Firstly, just because there is a sheet of filo pastry stuck on the plate doesn’t make it a tart. There are chefs that have worked hard to perfect pastry, which is one of the key components that defines a great tart. One single sheet of filo simply won’t do, not to mention there was nothing crispy about it. Then the seasoning was also off. At first bite he thought it was sugary sweet, as in signatory Singaporean sweetness that masked all other flavours. The good news is that the sweetness was completely out of the blue as the remainder of the dish was savoury. It wasn’t criminally poor. The scampi compact was cooked to retain a slight crunch, simply seasoned with a faint hint of saffron fragrance (minus the first bite), the flavours were fresh and clean. Unfortunately with the anticipation of a crispy savoury tart, this interpretation has somewhat fallen short. I was pleasantly surprised by the relatively chunky bloc of foie gras. The toasted sesame seeds gave a hardened, brittle skin to the liver, as well as sesame aroma to lift the heavy grease. The velvety centre was exuding fragrant goose fat and silky soft on tongue – such guilty pleasure. The eel was lightly smoked and pickled to preserve its succulence, it also accentuates its fishiness. It was an unusual combination of two pungent flavours; while separately the two items were most enjoyable, I can’t say there was much chemistry between them and the meek citrus jus did little to harmonise. A clear dashi broth was served on the side to cleanse my palate. Again the oriental nature of the modest broth somewhat clashed with the Gallic masculinity of the foie gras. It may have worked better if the dashi was presented as foam or in gelatinous form on the plate and swap the citrus component out as a cleanse. We both raised our eyebrows when this arrived, for difference reasons. He found comedy in the 3 crisps elegantly reclining on the plate; when did it become acceptable for fine-dining restaurants to be serving crisps as part of a main course? On the side of my £4.95 chicken sandwich lunch at Weatherspoon, I appreciate it. At a restaurant that is currently ranking 13th on Asia’s Top, they should be embarrassed. Moreover, this is a main. The 3 crisps had more plate coverage than the two buttons of ballotine; did the kitchen run out of pigeon breast? Or just food altogether? Essentially I was presented a plate of cold finger food with 3 crisps and 2 pieces of canapés. Not impressed. 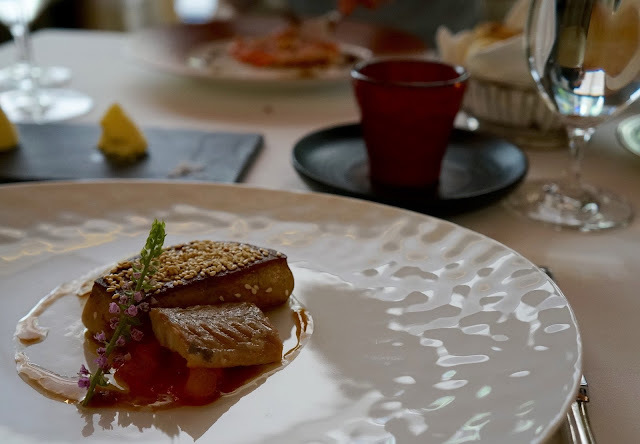 As for flavours, the lump of foie gras trumped over the bird; there was no balance, no depth, no structure – just a semi-liquid glaze to wash the mess down. For those who could work out which side of the table I was sitting on, you may have deduced this was my third course with foie gras. Yes I was fully aware of what I was ordering, just that usually, in London, where the ingredient is only mentioned in the description on the menu, it comes in small quantities – more in essence and spirits than form. Whereas at Les Amis, I have been served solid chunks of foie gras that makes up at least half of the dish. It was starting to get to me. His main was far from sensational too. The uneventful presentation aside, the cube of veal loin was raw. Those who have been following my posts would know that I like my meats as rare as it dares. However, not raw. After cutting through the meat, it revealed the deep pinkness of pure rawness, not to mention its cooler than lukewarm temperature. We sent it back; thankfully our server seemed to agree it was undercooked. In an ideal world the kitchen would have started fresh instead of re-cooking what we have cut through. However that would have been asking for too much at Les Amis, and as suspected, the kitchen re-fired the diced meat. The result, inevitably, was overcooked and slightly dry veal loin as the re-heating had drained the meat juice, leaking all the flavours away. The four tubes of macaroni that constituted a ‘gratin’ were soggy and bland - nothing to write home about. They really could try harder with the presentation. It was alright - I have had better. The souffle was much better, fluffy like a breath of bittersweet chocolate, sweetened and cooled by smooth fragrant ice-cream. He approved. Like I said, I think we started well at Les Amis, then somewhere between the two appetisers, things began to tumble downhill. It may have been poor choices of dish on my part, but the ingredients felt quite repetitive, which meant there was little variation in flavours. I’m left baffled by some of the design of the dishes, especially where strong opposing flavours began destroying each other. As for execution, the raw veal loin says it all. Service was generally quite good, though no one came to check on us during the meal and asked if we liked it. Maybe they used to and was sorry they had done.